After the basics of understanding the battery in our PV system we will now select the one that fits best to our application. First we will determine the capacity we need. Then we will have a look at different types of lead-acid batteries and which of them are well suited for the PV system. We have already calculated the consumption of electricity in ampere-hours. This is the base for determining the capacity of our battery. In bigger systems like PV for a house the rule of thumb is that the battery has to store the energy consumption of 3 to 5 days. This means the capacity in ampere-hours should be 3 to 5 times the electricity consumption of your load. E. g. when your load consumes 10Ah per day a battery with 30 to 50 Ah would be good. Beginning with this basic rule you can alter the capacity to a higher or lower level. A higher capacity brings you a longer time of autonomous run without energy from the PV module. The cycles for the battery will also become smaller. E. g. when you take 10Ah from a 20Ah battery and then recharge it you will have a 50% cycle. With a 40Ah battery the same cycle is only a 25% cycle. This means that the battery will live longer. But not double the time because it ages also by time and not only by usage. The drawback of higher capacity is higher cost and also higher self discharge. This last point is negligable in most systems unless you want a autonomous time of several months. Lower capacity brings you shorter autonomous time and shorter battery life as the drawbacks. When you don’t already know that your system will run unchanged for many years then lower capacity can be a good choice. Regading small capacities in the range of under 10Ah sometimes higher capacity is almost the same price as a smaller type. This can also be an important point. The big drawback of all this is that once you have chosen your battery then the storage capacity of your system is fix. When your energy consumption rises after a year or two you can’t connect another battery in parallel. The two batteries would have different age and then they don’t fit together well. The capacity of the newer one will decrease faster than normally. Switching batteries in parallel or in series is only good when they are totally the same. Same type, manufacturer, capacity and age (means what has happened with them before you use them). Everybody knows starter batteries from the car. 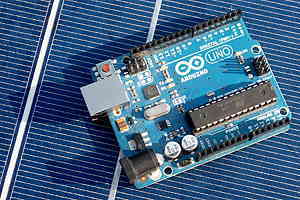 For a bigger (in terms of arduino systems) installation you could think about using one of them because they are rather cheap compared to the other types that will follow. But: They aren’t well-suited for our system. Starter batteries are built for providing a high current (some 100 amps) for some seconds until the motor of your car is running. Then they are recharged immediately. This usage is totally different to what we have in our PV installation: low current over long periods of time. The cycle life of a starter battery is around 100 to 150 full cycles and the efficiency is around 70%. This means that in the long run a starter battery isn’t cheaper than a specialized type because battery life is shorter and you will need a bigger PV module to compensate the low efficiency. This is why starter batteries aren’t a good choice for standalone PV. A word about old starter batteries: Simply forget about them. When they are old their capacity has decreased a lot. Self discharge is high and the efficiency very low. When you build a PV system with one of these old batteries you won’t have fun with it. When the system runs out of energy it’s most likely because of the bad battery. You can charge it with lots and lots of ampere-hours and you get back only a small part of that. They look like starter batteries but they aren’t. Some manufacturers take the same cases as for the starter batteries but the ingredients are different. These batteries are at a much higher price compared to a starter battery of the same capacity but they have a higher efficiency (around 85%) a much longer cycle life and low self-discharge. These batteries are rather big starting around 50Ah capacity and going up to 250Ah. They are built for a long battery life in a typical PV application. These batteries are available in diferent technologies, see below. They are similar to the solar batteries concerning cycle life but are better suited for higher current application. So when you have an application wherre you need sometimes a high current for a rather short time then think about using one of these. 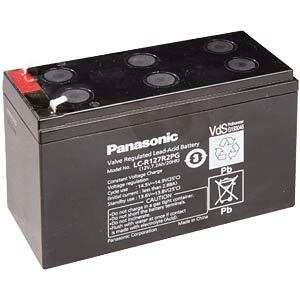 This is the classic technology of lead-acid batteries with liquid electrolyte that probably everybody knows. Historially this is the oldest lead-acid technology. Each battery type (starter, solar and traction) is available as a flooded battery. They are cheaper as the other technologies but have some serious drawbacks. First of all, they are an open system. This means that during normal use explosive gas (H2 and O2) and corrosive acid (H2SO4) leaves the battery. Therefory you need some venting to get rid of this. Also the battery can be used only in the upright position and you have to fill in distilled water from time to time and check again after some months. The other drawback is that they react very much on deep discharge. This shortens the batteries life a lot. In these batteries the electrolyte which is basically the same as in the flooded type is fixed in a gel that keeps the electrolyte in its position. Additionally H2 and O2 are absorbed and recombinated in the battery itself. In normal use the battery is closed. Only in case of overcharging then a valve opens to prevent high pressure inside the battery. This is why they are called VRLA batteries: Valve Regulated Lead Acid. A gel battery is in most cases the best choice for your PV system. They are very well suited for long time low current application. Gel batteries are also available for small capacities starting with 1.3Ah. For a small system this is what you probably should take. They are similar to the gel technology but the electrolyte is fixed with a glass fiber mat. They are better suited for high current or low temperature applications. 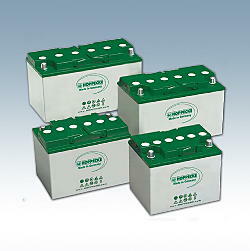 AGM batteries normally are also of the type VRLA and available in bigger capacities. So which battery is the right one? When you know the capacity you need then look what is available to you and at what price. Then it’s mostly a matter of how long the system should be functional and how much money you want to spend. Then you will see which is the right one for you. Here some links about batteries. Note that I am not in any way connected with these companies. I simply think that the information is useful. The Guide to VRLA batteries from DEKA inc. a US company tells a lot about gel and AGM batteries. The Overview Information on VRLA Batteries from Panasonic gives the technical information about their small batteries beginning from 1.3Ah. Next to come: The posts about the PV module. Already online: PV module basics and PV module dimensioning. After that the next steps are the charge regulator and finally building a system. This entry was posted in arduino, electronics, solar and tagged arduino, photovoltaic on August 19, 2013 by heliosoph. I’m thinking of making a automatic feeder for my horse and it needs to be powered by solar energy. I’ll use a Arduino and two servo motors. the motors will not activated at the same time and only 2 or 3 times a day. I read your texts, and was thinking of using an external solar rechargeable battery type these. my first thought is that they are too small. Everything depends on the amount of energy you need per day. First of all build your mechanics do some testing and then measure the current and time. Then you will know how big is the daily consumption of electricity. Reducing arduino’s average supply current can be done by moving it to another board (with only those components added that it really needs) and letting it sleep for most of the time. And you have to have a system working securely. Otherwise your horse will suffer from hunger. I have a couple of projects planned that will require solar battery-power. Your article has caused me to really focus my attention on calculating the load for the project and looking at board efficiency. I’m eager to see your final product. Sizing each component is a real challenge. His approach is to add a custom power controller which will power on the Arduino when needed. As he mentioned, this system would not be for controlled applications. The custom power controller looks quite efficient. Thank you for sharing your insight on this subject. Here is a brief outline of one of my projects. The microcontroller (Arduino or Netduino) will wake up every hour during the daylight hours and transmit wirelessly the ultrasonic readings via an XBEE radio and/or record the readings on an SD card. The ultrasonic rangefinder will measure the distance, in inches, from the top of a water tank to the actual water level. This data will provide hourly water storage level readings for a given day. Other ideas are to place two inline water flow meters to record gallons being pumped from the solar pump and water consumed. Operating an Arduino for a Year from Batteries. .